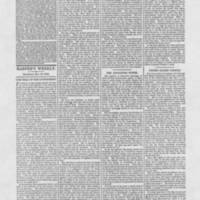 The article was published on May 26, 1866, by Harper’s Weekly, a Republican newspaper, to share its opinions on the Reconstruction efforts in North Carolina with a broad audience. This article accused President Johnson of being too soft on the Southern states and advocated for more, hasher conditions for readmission back into the Union. It criticized Johnson for putting party advantages ahead of public welfare, meaning Johnson's policies were designed to court potential white voters over to the Republican Party instead of securing the rights of all men in the Southern states. Harper’s Weekly then advocated that African Americans be given the vote and only then would states be allowed to choose their own destiny. They concluded that Johnson’s policies will not be successful, so why not take the burden off of the federal government and leave it up to the states. This article highlights the debate over suffrage and voting rights as well as the split between Republicans that continued throughout Reconstruction. "The Trial of the Government," Harper's Weekly, May 26, 1866, Harpweek, accessed November 6, 2014, http://harpweek.com. sodes of this interesting time. Cowan, of Pennsylvania, is a representative. rightful action is not subject to their discretion. the most careful investigation and reflection. States should still seethe with angry passions. dence. Great risks are of course to be taken. That is the inevitable law of the situation. against it, and would doubtless vote against it. their old activity and repair their fortunes. thus evident. It was the late slave population. The war had made them freemen and citizens. tional peril its sacrifice becomes necessary. gested by the Committee of Reconstruction. mends itself to every loyal man in the country. system of government has ever been exposed. Harper's Weekly, "THE TRIAL OF THE GOVERNMENT," May 26, 1866, Civil War Era NC, accessed April 24, 2019, https://cwnc.omeka.chass.ncsu.edu/items/show/2738.